The Pan Caribbean Partnership against HIV and AIDS (PANCAP), the mechanism that provides a structured and unified approach to the Caribbean’s response to the HIV epidemic, relaunched the Champions for Change initiative during a ceremony on Tuesday, September 12 at the Guyana Marriott Hotel, Georgetown. 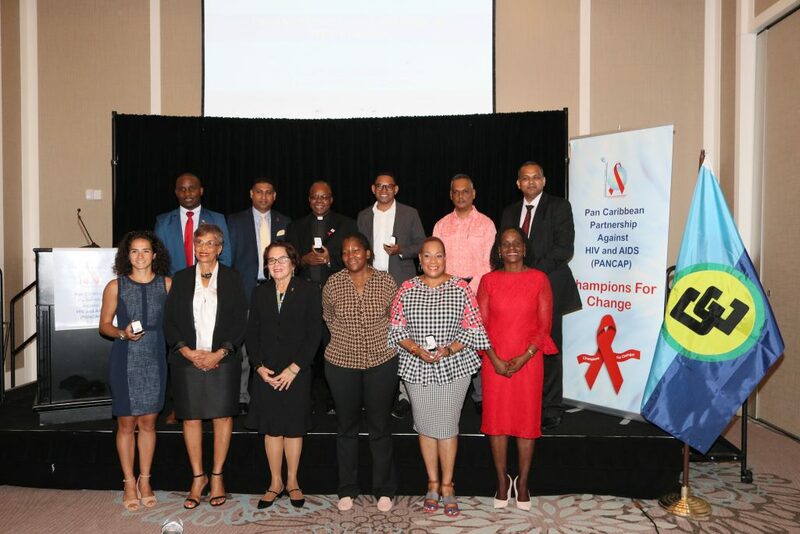 Sixteen advocates for ending AIDS from across the region within civil society organisations, National AIDS Programme Managers, faith leaders, academia, youth, regional parliamentarians were recognized by PANCAP for exceptional work in advocacy. The highlight of the event was a keynote address by The Rt. Hon. Sir Charles Michael Dennis Byron, President, Caribbean Court of Justice, who urged the new Champions to use their combined influence to make significant strides to reduce stigma and discrimination against HIV people living with HIV and to implement programmes and activities that seek to end the spread of HIV. In his examination of Judicial Attitudes and HIV and AIDS within the context of positioning the judiciary to effectively contribute to ending AIDS by 2030, Sir Byron contended that HIV affects every aspect of the human condition and, as such, it requires an informed, rational and just response if we are to be successful in ending the epidemic. ‘This premise is relevant to the judiciary in the discharge of its duties as guardian of the due administration of justice and protector of human rights’ contended Sir Byron, who also observed that law is an important structural determinant of health. Sir Byron reasoned that judicial officers must exhibit and reinforce anti-discriminatory attitudes and practices that will supplement and underscore the efforts being made to end the epidemic. Judicial officers must manage what goes on in the courtroom, to ensure that persons who are susceptible to discriminatory treatment are treated fairly by all players in the judicial process including court staff, counsel, police officers, witnesses and such others. Sir Byron proposed that it is incumbent for judicial officers to equip themselves with the requisite knowledge about HIV and AIDS, not merely knowledge of the law relating to HIV and AIDS, human rights, anti-discriminatory laws and the like, but also knowledge concerning the disease itself and issues which affect and promote the spread of the disease such as, for example, gender inequality. ‘Judicial officers must adopt a proactive stance to acquiring and updating this knowledge – we must obtain the relevant tools and materials’ stated Sir Byron. Sir Byron shared his views on the role of the Caribbean Court of Justice. ‘As President of the CCJ, it is my view, that as an apex Court our reach should extend beyond the precincts of the Court and our adjudicatory functions. As a Caribbean institution, we must engage in activities which improve access to and the quality of justice for all and instill confidence in the fairness of the judicial system and the administration of justice’. Sir Byron noted that in dealing with attitudes towards knowledge and capacity building, the propositions made in PANCAP’s Model Anti-Discrimination Bill for the establishment of a dedicated Anti-Discrimination Commission and Tribunal must be appreciated as they indicate a positive attitude towards capacity building. ‘The establishment of a dedicated grievance resolution system means that complaints will not be hampered by existing case backlogs within the current judicial systems across the region, which unfortunately still cause inordinate delay’, contended Sir Byron. Assistant Secretary-General, Human and Social Development, CARICOM Secretariat, Dr Douglas Slater spoke on behalf of Ambassador Irwin LaRocque, Secretary-General, CARICOM. He stated that the ‘PANCAP Champions for Change initiative presents a unique opportunity to transfer the best practices learnt through PANCAP interventions, to the public health sector in the Region’. He described PANCAP as a best practice within the Region for coordinating and orchestrating effective interventions particularly among civil society organisations. He also referred to PANCAP interventions and capacity building for National AIDS programme managers as significant steps in the response to the spread of HIV. Honourable Nicolette Henry, Minister of Education, Guyana in her remarks recommitted to using her influence to reduce stigma and discrimination within the health sector. She urged that health care practitioners should be professional and warned that stigma and discrimination are aiding the continued spread of HIV. ‘Treating people with dignity and respect should be at the forefront of the response to HIV,’ stated Minister Henry, ‘I am committed to speaking out against discrimination and will use my office to ensure people living with HIV receive the care and treatment they require’. Ms Joan Didier, Board Member, Caribbean Vulnerable Communities Coalition, in her remarks stated that civil society is ‘imploring policy makers, parliamentarians and all those with influence to ensure that people living with HIV are not discriminated against when they seek help from public health institutions’. ‘A scornful look or an attitude of concern and care from a nurse or doctor, could mean the difference between life or death for someone with HIV,’ stated Ms Didier, ‘Champions, I urge you to use your platform to empower people living with HIV’. The ceremony concluded with Sir Byron issuing an inspired charge to the new PANCAP Champions. ‘Efforts over the next few years will decide whether we will end AIDS by 2030 or face resurgence’, stated Sir Byron, ‘In over four decades of the epidemic, science, social mobilization, political commitment and coordinated response among key stakeholders have made it possible to end AIDS. History shall not be kind to us if we become complacent now’. The 2017 Champions for Change include Guyana’s First Lady, Mrs Sandra Granger for her outstanding leadership and championing of the ‘Every Caribbean Woman, Every Caribbean Child’ Initiative; the Executive Director of LIVE UP Dr. Allyson Leacock; Attorney-at-law Dr. Arif Bulkan; Canon of the Cathedral in the Diocese of Jamaica and the Cayman Islands, Canon Garth Minott, Member of Parliament (Guyana), Dr. Frank Anthony; the Chief Executive Officer of the Institute of Law and Economics (ILE), Jamaica, Dwayne Gutzmer; Founder and Managing Director of the Society Against Sexual Orientation Discrimination (SASOD) in Guyana, Joel Simpson; Executive Director of the Eastern Caribbean Alliance for Diversity and Equality (ECADE) Kenita Placide; Speaker of the National Assembly of Belize and Chairperson of the National AIDS Commission, Laura Tucker-Longworth; Chair of the Caribbean Forum for Liberation and Acceptance of Genders and Sexualities (CariFLAGS), Lucien Govaard; Guyana’s professional squash player, Nicolette Fernandes; President of the Barbados Evangelical Association, Rev. Dr Nigel Taylor; Director of the National HIV/AIDS and Infectious Disease Programme at the Bahamas Ministry of Health, Dr Nikkiah Forbes; Trinidad and Tobago Minister of Health, Terrence Deyalsingh; Deputy Programme Manager within the Communications Unit at the CARICOM Secretariat, Volderine Hackett; and Senior Pastor of The Poonah Open Bible Miracle Centre (POBMC), Trinidad and Tobago, Rev. Winston Mansingh.